FAA Version 2.28 - free! Reviews code snippets and lets you filter adaptations by file, class, and more. This downloadable setup program is a Visual FoxPro 9 executable that simply creates the necessary files in your 'Application data\Visual FoxPro 9' directory. At each startup, FoxInCloud Adaptation Assistant checks http://foxincloud.com/ for a newer version and updates accordingly. FoxInCloud Application Server, Trial Edition, lets you test your adapted application on http://localhost/. 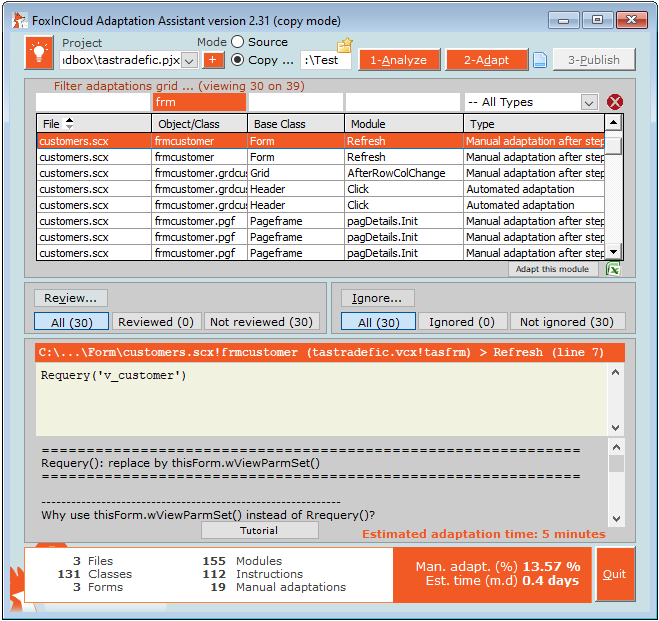 FAS Trial Edition can run up to 10 forms in debug mode within the VFP IDE.